OfficeTally Survivor Poll is a series of fan polls posted in the summer following a full season of episodes. Similar to the Survivor reality show, you’ll “vote off” your least favorite Season 8 Office episode in each poll, until the lone survivor and most popular episode remains. We now have a winner for Survivor Season 8, check out the rankings below! Here’s The Office’s Kate Flannery visiting Jay Leno on ‘The Tonight Show’ last night! Clip 1: How Kate’s boyfriend got in good with the family. Clip 2: Kate reflects on the finale season of The Office. Here’s a new poster of The Office cast! Click it to see a larger version. What final season questions do you want answered? Now that The Office showrunner Greg Daniels has announced that Season 9 will be the final season of the show and that “all questions will be answered,” which questions do you want answered? Why are they making a documentary of The Office? Who is the Scranton Strangler? What did Jim write in his Season 2 Christmas card to Pam? Will Jim pursue his dream of being a sports writer? 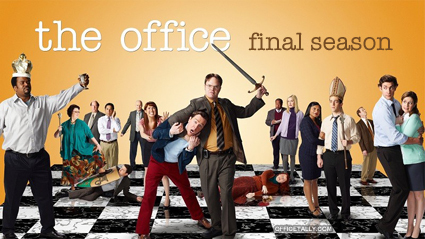 In a conference call today, The Office showrunner Greg Daniels announced that Season 9 will be the show’s final season.